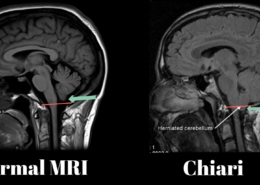 After the wide success of my article Anatomy of a Headache I decided to tackle another common problem we see every single day in the office. When someone gets an acute pinched nerve, it can be amongst the most painful problems that afflict human beings. Pinched nerves can leave people in lying in bed with an inability to work, exercise, sleep or play. When it happens people take on really strange and awkward postures to try to avoid the pain. If you are like Mr. Stock Image here where you lean away to one side and lift your arm, you might have a pinched nerve in your neck. But there’s a lot of misconceptions about what a pinched nerve actually is. 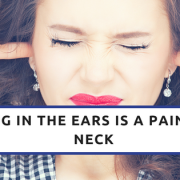 A lot of people feel like if their neck or back has a pinching or stabbing type pain, then it’s likely a pinched nerve. 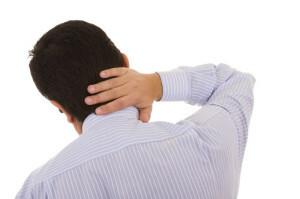 However, multiple types of neck pain can lead to a pinching type of pain. A true pinched nerve involves multiple factors. There are several different types of tissues that can pinch a nerve. Bone, muscle, tendons, and calcified ligaments are all compress nerve tissue throughout the body. Even tumors can cause pinched nerves, but those are in much more rare circumstances. The overwhelming majority of pinched nerve pain stems from a problem you’re probably familiar with. 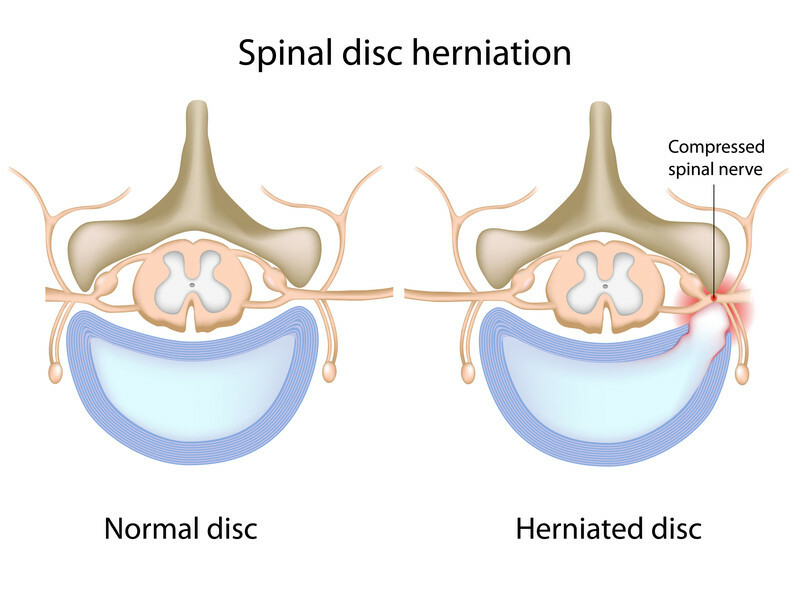 The slipped/herniated disc. Tearing of the outer part of the disc allows for a gel like material to spew out into a small space where a nerve travels. 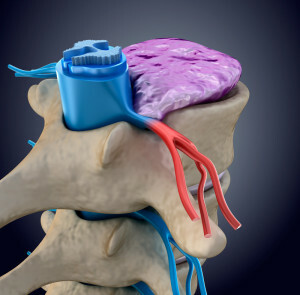 Most herniated discs don’t cause problems. 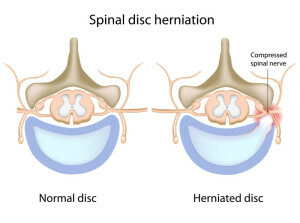 I can take an MRI of 100 random people with no pain and chances are high that many of them will have a disc herniation. 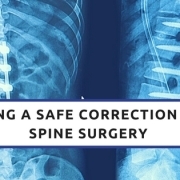 The herniation only becomes problematic when it is large enough, or you move in a way to force this gel into the nerve against some of the other hard structure in the spine. Nerve tissue is soft and sensitive. Even small amounts of pressure against a nerve can make it go haywire. They are like the iPhone charging cables of the tissue world. Just a little bit of stress and the whole thing comes unraveled. That’s why your body protects the most sensitive nerve tissue (brain, spinal cord, spinal nerves) in a case of bone called your skull and your spine. But it’s not just sensitive to pressure. It’s also sensitive to chemical signals like inflammation. Which brings us to the third important piece of anatomy. 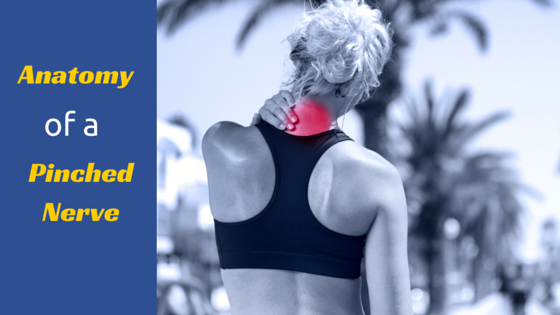 Inflammation from a torn or damaged disc can build up around the nerve and stimulate the nerve to create a pain response. This is especially true when you injure a disc very suddenly….like in a car accident or picking up a heavy box. Cells from your immune system rush to the site of damage and try to clean up the mess. 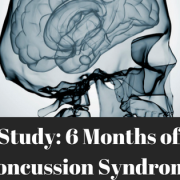 The result is a large number of inflammatory molecules called cytokines and substance P fills that area and can trigger a pain response from the nearby nerve. I always compare the body’s use of inflammation to a fire/burning process. When your body uses inflammation it is like using a fire to burn away germs or damaged tissue in the body. The main problem with fire is that it can sometimes cause damage your own body too. This is especially problematic when inflammation affects a nerve. 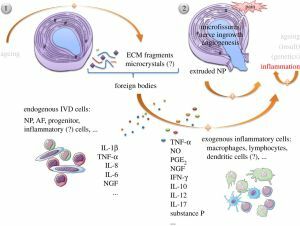 Inflammation ain intervertebral disc degeneration and regeneration. Journal of the Royal Society Interface. 2015. 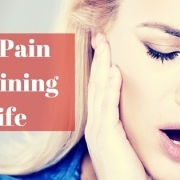 The pain from a pinched nerve can be excruciating. It’s not uncommon for someone with pain from a fresh pinched nerve to go to a hospital to get checked for something serious. With that said, the pain from a pinched nerve is not the worst thing that can happen. The worst case scenario for pinched nerves are a loss of function. If you have a pinched nerve and you start to have things like weakness and complete loss of feeling in your arm, legs, or hands, then it can be a serious issue that needs to be addressed by a surgeon. 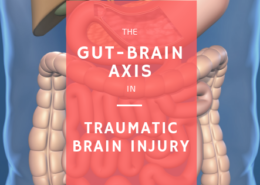 In cases of pinched nerves in the lower back, sometimes the nerves can affect bowel and bladder function leading to a condition called Cauda Equina syndrome which is a medical emergency. If left for too long, your muscles can begin to atrophy and you may never get full function back. These are scenarios that shouldn’t be trifled with. That previous section wasn’t meant to scare you, but it’s a reality that we sometimes we have to face. The good news is that the vast majority of pinched nerves respond great to conservative care. That means things like physical therapy, anti-inflammatories, and decompression can all be helpful modalities in dealing with pinched nerves. 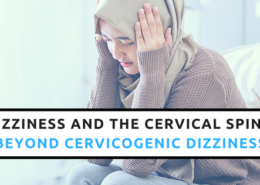 All of the above therapies can provide some relief from the pain of a pinched nerve, but one thing that is important is addressing some of the biomechanical issues that lead to a herniated disc becoming a pinched nerve. The spine has many functions. It protects the delicate spinal nerves, it’s the central attachment point for numerous muscles, and allows for a wide range of movement. Another key function is the way that it distributes force throughout the body. 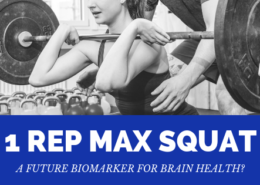 One of the key facets of Normal Structure is that it provides an ideal way for the human frame to distribute force evenly through the body’s muscles and joints. 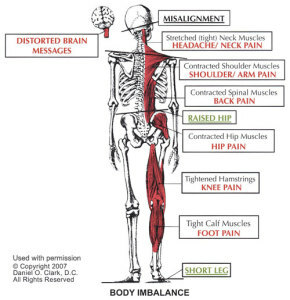 When we lose normal structure, we start to put more stress on some parts of the body over others leading to increased joint stresses in select areas. Want proof that your structure exacerbates pain from a herniated disc. Look at the way that people hold their posture. People with pinched nerves usually can’t stand bending their neck or back in a specific direction, so they lean towards one side over the other. You’ll also see that they avoid forward bending too. But why? Because bending forward and into the side of the pinched nerve will increase force into the disc and force it further into the nerve. That’s why correcting the underlying foundation of the spine helps with pinched nerves because we can help the body naturally equalize the forces going into your discs. Sometimes the body will actually find a way to make the herniated disc go away! 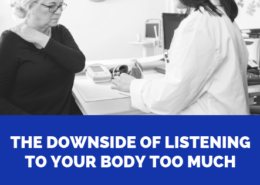 Although it’s not expected, the body is always going to move in a direction of healing itself, and sometimes that means getting rid of an offending disc problem. 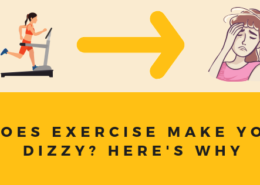 Why Does My Back Hurt When I Breathe? What is it and how to fix it?